You are here: Home / Diary / My Amazing Winner! Here are Boodie and I to announce the winner of the Cat Amazing Cat Toy! Unfortunately, Binga could not join us, mainly because she wouldn’t stop trying to get the treats out of the holes long enough to help! My human finally had to put her in a room downstairs so we could do this. Tania’s kitty, Sammy, is a Somali like me and I will tell you something about us Somalis — we use our paws like hands. So I bet Sammy will have a blast with this toy! Boodie also wants to remind Sammy about the treats. That is her favorite part! 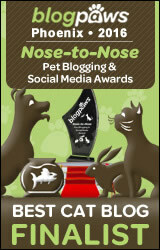 I also wanted to mention that last night, my human was uploading my blog post at 2:30 A.M. and she forgot a couple of blog friends that I wanted to give Blog of the Year awards to! Can you believe it? I don’t know what is wrong with her — I am awake and ready to play at that hour! Anyhow… one, The Daily Abyssinian, said they wanted it, which jogged her memory, so I am giving it to them now… and they passed it along to the other blog that escaped my human’s brain, The Poupounette! Meanwhile, I got a star back from my Aby friends, and Oui Oui pointed out that they too had given me the award last week, totaling five! 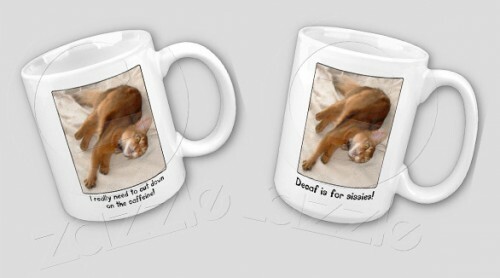 Lastly, I wanted to mention that I have a couple of new mugs for cat and coffee lovers at my Zazzle Store! My human put them up yesterday because Zazzle was having a sale on mugs. 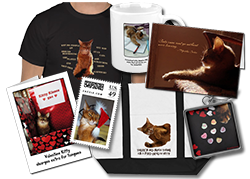 Lately, she has been making new items as Zazzle announces sales and coupons. This is fine with me, as long as she doesn’t forget who I am giving awards to again! Concatulations to the winner – Sammy And that yous gots more stars and the new mugs looks fabulishious! That was an awesome giveaway! Congrats on your stars and we love your new mug design too. PS: We read your Mousebreath interview when it came out and loved it but unfortunately didn’t get here to tell you that till now. Concats to the lucky winner! That seems like a great toy and something that would hold our interest for a long time. Boodie’s tongue is strangely alluring. And concats on your STARS! You only need one more. Can I give it to you just for the heck of it even though I am finished wif my stars? I’m just gonna do it because you know, I don’t think there’s a Star Sheriff, do you? Yay to the lucky winner. I saw! I hope he enjoys it! Boooooodie is so booooodiful! We had a rag doll once, her name was Lucy, when That Woman’s mom’s persian went to the bridge we let her haz Lucy. (Acutally, Lucy was short for Lucifer as she was quite the little hissy witch!) You are all lovely. On Concats to the winner they will have lots of fun time with that new toy! Congratulations to Tania, we bet her clever kitty will love this toy!!! What’s the problem with the humans and awards, seriously? Concats to the winner and concats to you for the award! Concats to the winner. I love my puzzle box. Mine is wood but it’s all the same really. Concats on your winner and concats on all your stars. Beleive me, you wouldn’t want to see TW on caffeine. She can only drink decapitated coffee for the safety of the rest of us. Congrats to Tania. Have a stellar day! ConCATulations to Tania B ! Hooray for the winner! !, Congrats on the stars too, but you are a star! Congrat Tania! Sammy will have so much fun! Concats to Tania B.! And how cool is it that Sammy is a Somali just like you! A big congrats to Tania B. That looks like a really fun toy. And good job getting all those stars so quickly. Our Mom can’t remember who gave us awards much less who to give them to. The mugs are cute too. Take care. Sparkle we liked seeing you in the picture with Boodie – we can’t remember seeing Boodie before but she does have lovely furs – of course not as lovely as yours Sparkle. Congrats to Tania! Sammy is gonna have lots of fun with that toy!! Thanks, Sparkle! We’re very touched!